New publication 'The Mammoth Book of Street art' is an insider's selection of the most outstanding graffiti and other street art from the artists themselves. Informed by his love of hip hop and grafitti, editor JAKe has compiled a fresh, diverse collection of streetart drawn from Rio, Berlin, London, Philadelphia and other street art hotspots. The emphasis is on humour and the artworks venture beyond grafitti to 'installations' such as RONZO's Credit Crunch Monster, cemented in the centre of London's financial district. JAKe brings an insider's awareness of context to this collection which comprises both photographs from his personal archives and a selection of the world's best street art from the artists themselves. 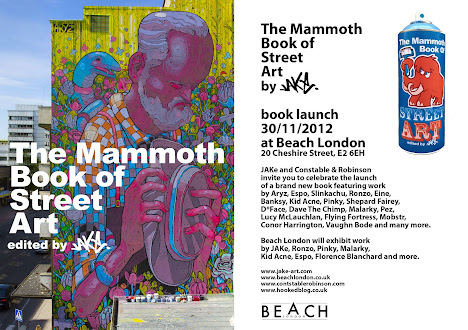 The Mammoth Book of Street art will be launched this Friday 30th November at Beach London. The evening will also see work on display from JAKe, Ronzo, Pinky, Malarky, Kid Acne, Espo, Florence Blanchard and more.